Oh, and since we usually call Muddy Buddies "Monkey Munch", the kids thought this snack should have an animal name as well. They've dubbed these "Lemon Shark Snack Squares". Their new name is a little bit long for me, but whatever you want to call them, they're yummy! 1. Measure your cereal into a large bowl and set aside. 2. Grate your lemon and squeeze out your fresh lemon juice. 3. Put your lemon peel, lemon juice, white chocolate chips and butter in a microwave safe bowl and microwave on high for 1 minute. Stir, then microwave another 30 seconds or so until it's all melted and well combined when you stir. 4. Pour the lemon mixture over your cereal and stir gently to coat the cereal. 5. Put about half the cereal mixture in a gallon size Ziploc bag, add one cup of powdered sugar, then add the rest of the cereal and the other cup of powdered sugar. 6. Tightly seal up the bag and shake to coat the cereal with sugar. 7. Spread on waxed paper to cool, then store in an air-tight container. This snack is really tasty and would make a cute little gift if you packaged it up in a pretty bag. Oh my that sounds delicious! Definitely something fun to make with my daughter. I've had the muddy buddies mix but this sounds so yummy! I am going make it for my son's next play date. Thank you!!! Ohh that sounds delicious! I love lemon flavor. Your little helpers there are adorable! My daughter for sure would love that! Thanks for the tutorial.. yummmyyy!! Thank you for this!!! YUM! I am going to have to pick up the stuff to make these. Hopping over from Tip Junkie. Come stop by my blog to enter a giveaway for some gorgeous jewelry that ends on Thursday. 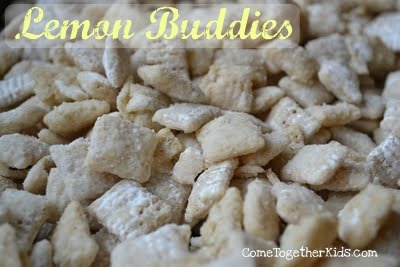 I love lemon, I love Muddy Buddies... So this just has to be FANTASTIC! I don't even like lemon, but my husband does, so being the good wife/mom I made these for him after a hard day at work, and WOW!!! These are AMAZING!!! I will keep lemons at hand for the rest of my life now! THANK YOU!!! What a great take on muddy buddies...or as we say puppy chow! This would be perfect for my Foodie Friday linky party - stop by this week and link up! We just made this tonight for our "F.H.E." treat and my boys (2 and 5) loved making them and especially loved eating them (and i did as well)! They turned out great! Thanks again for the idea! I'm so glad you all like this recipe! We've finished off our first batch here and the kids are asking for more. Oh YUM - we're so trying this one, Laura!!! I've been jonesing for lemon like crazy these days and Audrey would love to help with this - one of her favorite new ingredients are "white chips" They'd make cute little Easter gifts packaged for spring! These sound so good!! I love it! I am a new follower and I would love if you would like this up to Made by Little Hands Mondays! Wow!!! This is a great idea and something I will use for an upcoming party. I can't wait. I made these with my little boy today-they're delicious! Linking over in my blog post today. Love this, hubby (87) will eat all so little at a time. Your lovely children thank them. Thank you for posting this recipe my family is a huge fan of the puppy chow as they call it here in iowa. but since i have allergies to peanut butter i havent been able to enjoy it with them . this is a great alternative to the puppy chow. thank you so very much again. i cant wait to try this one today. well im off to town. have a great day. Thanks! This was simple and delicious! Great video clip content across the web. though there Vidmate App Currently a days, internet video clip streaming Fine. awesome as well as it can be a little frustrating when you are in the flow after https://setbeat.org musicians and also recommended music based on your general styles great. Online components like films, songs, sports on Kodi for Firestick APK web link offered. This is the APK provided.